Addition of the bulky reducing reagent lithium tri-t-butoxy aluminum hydride [LiAlH(OtBu)3] to acid chlorides results in the formation of aldehydes. Similar to esters (reductions with LAH and DiBAl-H), aldehydes cannot be produced with common reagents for reduction, such as lithium aluminum hydride (LAH) and sodium borohydride. Using one equivalent of LAH simply leads to a mess of products. To prevent such overreduction, the LAH must be modified with three equivalent of 2-methyl-2-propanol (or tert-butyl alcohol). 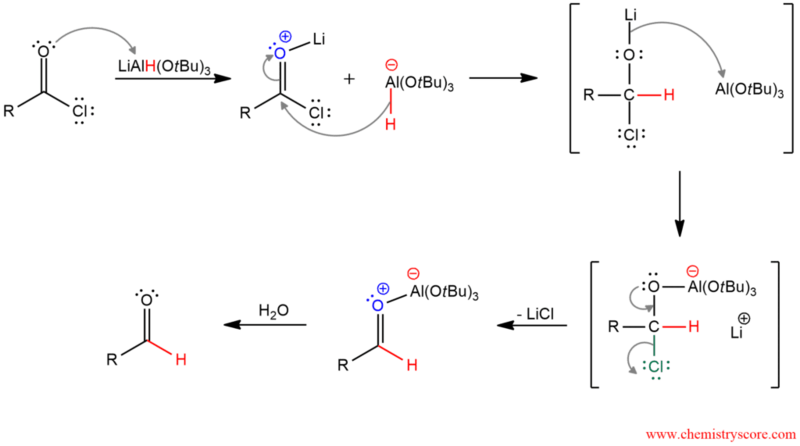 In this manner, three of the reactive hydride atoms will be neutralized, leaving one behind that is enough for reduction of acid chloride but not the resulting aldehyde.